The agony of contemplating bankruptcy. Omaha Bankruptcy attorney shares his experiences. Understandably, the thought of filing bankruptcy makes most people very uncomfortable and, for some, physically sick. Feelings of shame and complete failure are common. Depression and anxiety are in full swing in many cases. Even people that seem to have outwardly come to accept their need for bankruptcy still have that nagging little voice inside asking: Is this the right thing to do? Because I chose to focus my legal career around helping regular people deal with their financial problems, I have had a unique opportunity to listen to thousands of souls tell me their worst fears and thoughts, at perhaps one of the lowest points in their life. It is because of this situation that it is very rewarding to be able to help. Help means talking through the various problems and sharing possible ideas and solutions. Help means giving full consideration to every legal and moral option to the client. This process of contemplation and discussion sheds light on a person’s problems and possible solutions. Understanding the facts about bankruptcy makes it easier to accept. I would say that most people are misinformed about bankruptcy in many ways, in all of its flavors. There are preconceived ideas of what it is, what is available, what it does, etc. Sometimes those ideas are accurate in part, but bankruptcy is actually a very complex legal tool that is meant to help honest people get a fresh start. Of course, honest people make some bad choices too. Who doesn’t? The bigger picture is to realize that bankruptcy has many different outcomes depending on the facts of a particular case. And, knowing and understanding the facts really has a psychological impact on the person contemplating bankruptcy. I guess it is somewhat like counseling. Just talking through the financial details of the problem really helps set a proper frame of mind. But what about the shame factor? What will family, friends, co-workers and neighbors think? 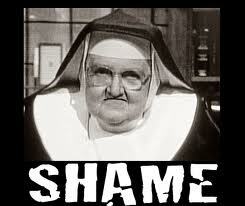 Shame has been defined as a painful emotion caused by a strong sense of guilt, embarrassment, unworthiness, or disgrace. ((The FREE Dictionary by Farlex)) This is a hard one to address. Yes, filing bankruptcy does start with a feeling of shame. But, something seems to happen to the emotional state of people filing bankruptcy as they prepare for it and as they proceed through it. I think that this “something” is the realization that they are DOING SOMETHING. They are doing what they must do. They have to move on with life and do what is best, under the circumstances. I see a gradual but definite progression of emotional state from shame to that of relief, optimism for the future and personal achievement (in the sense that the problem has been dealt with). But it’s more than that, too. It’s like watching a person come back from the dead or from purgatory. They were once dead….but now they can live again, albeit with some scares. The shame factor is also addressed by more fully understanding what events happened to get into a bankruptcy situation. There is an acceptance process that occurs inside. People filing bankruptcy somehow begin to see the truth about life in the sense that all people have significant problems, just different ones. We don’t always get to choose our problems. We just get them. Ultimately, when one is mature enough to realize that all people have problems, then the real focus becomes that of problem solving, instead of finger pointing. Mature and honest people realize this and are joyful and accepting when a person earnestly tries to overcome their problem. Filing bankruptcy, for the vast majority, is the process of dealing with a serious financial problem. They are trying to make things better. They are trying to solve their problem in an honest and public way. They are not hiding from their creditors, they are directly facing them with full and complete disclosure. They aren’t running any more. They find the courage to show their cards and bear their secrets. How brave! I wonder how many finger pointers would be willing to bear their faults publicly?